Stepping out in faith. Doing the hard things. Feeling unsteady. Doubting your next move. I believe that the Bible is applicable to ALL life… not just the hard times. Not just in your personal life. Not just in the chaos. Not just in the calm. Not just at church on Sundays. Yes, even in your business. Hebrews 11… (go ahead and read through it now if you want to follow along) is straight up chock-full of dreamers stepping out in faith and doing the hard and SCARY things. The impossible things. And if there is one thing that we learn through scripture, it is that God uses the most unlikely people to make HUGE, world changing impact. Normal ‘ol people. Yep, I’d say that’s me. I’m guessing that’s you too. By faith Noah (a normal man) built an ARK to hold his family and 2 of all the animals of the world to save them from a flood that would completely cover the earth… People thought he was legit CRAZY to build a HUGE boat, the size of one and a half football fields, in a region that was completely land locked. It seemed absolutely impossible that there would ever be enough water to float the vessel (Hebrews 11:7). Everyone laughed, yet by faith Noah did it because that’s what God called him to do. And God did what he said. The water came, the boat floated, the animals and Noah’s family lived. And God did what he said. Moses and his people were delivered out of slavery because of Moses’ obedience. By faith Abraham (a normal man) left his home to travel to a new home but he did NOT KNOW THE DESTINATION (Hebrews 11:8). He only knew that God had called him, so in faith, he went… unsure of where he would end up but knowing that God would provide. And God did what he said. God gave him a place to live, a son when his wife was past her child-bearing years, and even fulfilled His promises of descendants that were more innumerable than the specks of sand on the seashore. Taking that next step that God has called you to. Whether it be wiping runny noses, changing diapers, hearing “mom” 1,000 times a day, and longing for a trip to Target (and of course that includes a Starbucks drink) all by yourself… or whether it be starting a business, going against the grain, doing something people might think is crazy, sharing it unashamedly because you have a message that the world needs, and doing it for God’s glory even when it’s possible that no one will understand. Because that message is your calling. Because your calling is your responsibility. Sometimes there will be victories… and sometimes it will be hard. Sometimes it will be beyond hard and you won’t know how you’ll make it another day. BUT… here’s the next step for you and me, fellow busy, tired, overwhelmed, yet-still-daring-to-dream entrepreneur. KEEP GOING. One step at a time. Keep running the race set before you. Keep on keeping on with endurance. Because this journey is a marathon, not a sprint. And how do we do that? How do we keep on when we feel like giving up? 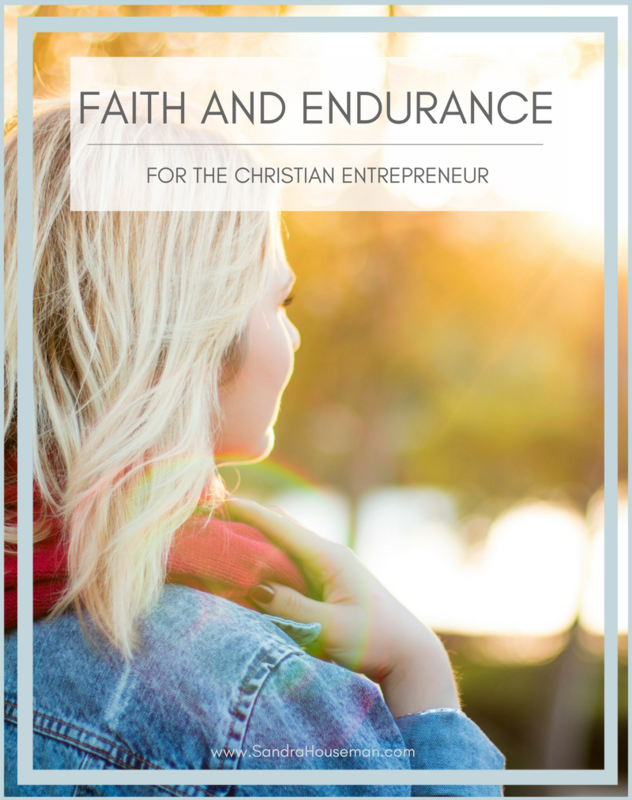 How do we keep on going when we feel like we have no endurance left? There’s no better message that I could think of giving you today. A message of hope. A message of peace. A message of freedom. There’s no greater plan for your business. A plan laid out for you by the same God who split the Red Sea. The same God who relentlessly loves you. The same God who is ready to use us “normal people” to change the world.